It’s been a little while since I’ve done an update of my Lending Club progress. For those who haven’t been regular readers earlier this year I looked at my Lending Club performance and was disappointed by the return of 4.78% – 84% of Lending Club investors did better than I did. I didn’t add a lot of money in that time. In fact, I’ve only added about $450. The rest has been the result of reinvesting payments in my new strategy. In my last update, a few people asked some very good questions about my Lending Club performance. The questions were a little too good… it would take me a few hours to answer them and I haven’t been able to set that kind of time aside. Instead, I figured I’d try to give a little more input until my new strategy with the hope that at least answers some of the questions. Review Status = Approved – It’s comforting to know that Lending Club looked over the loan and approved it. Credit Score => 714 – Even though I’ll be taking loans with high returns, I want a good credit score. Exclude loans invested in – I check this. Diversification 101. Months Since Last Delinquency = 24 – This is an area I should look explore switching to 60. My fear here is that I’d eliminate many loans. On the other hand, I do have the credit score filter which should factor in months since last delinquency. Delinquencies (Last 2 yrs) = 0 – In light of the above bullet point, feel free to call me Mr. Redundancy. That’s really all I have. The overall strategy is to get those loans high percentage loans while trying to weed out some as much of the riff-raff as I can. At the beginning of the year, I viewed Lending Club as simply good diversification similar to adding bonds to your portfolio. Now, I could see it playing a little more significant role (though probably still less than 10%) and perhaps even out-pacing the equities portion of your portfolio more often that you might expect. Great post, dig the details. It’d be interesting for you to track the changes to your portfolio and your subsequent returns over time, perhaps a monthly updated graph or chart of some sort? I’m seeing more and more blogs reviewing and talking about Lending Club. We’ve got a partnership in the works with those guys and I think P2P lending is one of the few promising/innovative things that’ll help save people in debt. I’ve been at lending club for awhile now and have slowly been increasing the amount I invest as I don’t have a lot to work with. I really like it so far. I am getting close to 10%, like you I started out only doing the low risk, grade A loans. In yours, I see the “charged off”–what does that mean? I haven’t had that happen yet. Also, have you or anyone had any experience with anyone defaulting? I’ve seen some people late on payments, but usually they get it together! One thing I feel funny about is, a lot of the people I loan to have WAAAAAY more money than I do when I look at their salary and what they are paying for. It feels odd funding them getting out of debt with my meager income! Charged off is what happens when Lending Club has exhausted all methods of recovering the funds and considers it a total loss. Ry, you bring up a great lesson. Debt is not always an indicator of low-income, but often a reflection of poor money money-management skills (or simply bad luck). I have the same experience with LC that “ry” does: most of the loans that I invest in are being applied for by folks that make a lot more than I do, and who also have much better credit than I do. There’s a lesson in there somewhere. Anyway, I’m at close to 11% with LC returns since I started with them about 10 months ago. Good post Lazy Man. 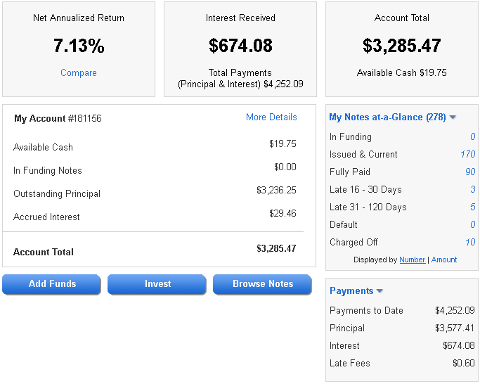 On my new IRA account I am also focusing on D-G loans and after six months my NAR is over 18%. Of course, that will come down because these are higher risk loans and I expect some defaults as my account ages. I like your filters although I would add Number of Inquiries = 0. If you do some research on Lendstats.com and analyze the D-G loans, historically adding inquiries = 0 will give you a 1.5% ROI bump. By adding this filter you are avoiding people who are out shopping around for credit and may be a higher credit risk (particularly in the higher risk loans). I hadn’t done the number of inquires in the past, because I consider someone who is shopping around for credit a smart consumer – one who is looking for the lowest rate available. Logically, I would presume these smart consumers are more likely to pay off their loans to maintain a great credit score. Perhaps my logic is faulty somewhere? No matter where i go I always hear good things about lending club. However, i don’t have any experience with them. Maybe i will soon. I would forget about all the other low risk investments. From my experience low risk is simply not worth it, the return never satisfies. Lazy Man, i know you can get that percentage up to 10 percent. Don’t let that hurt your ego because i believe in you. Lazy Man, Typically if you are just shopping for credit the financial institution will do a soft pull of your credit which will not result in an inquiry on your credit report. This is what both Lending Club and Prosper do when a borrower applies for credit. But if you are applying for and obtaining credit cards or other lines of credit then this will show up as an inquiry. If someone has obtained three new credit cards in the last six months that could be a red flag that something is up and their ability to pay may not be as good as someone with zero inquiries. That’s my understanding of the logic. I’ve been using LC for almost 2 years… got 9% return the first year and looking to about the same this year. I use a strategy that involves using the trading platform to activley dump loans that go late/grace period. I lose a little potential return this way, but garantee very few to no defaults. That being said, I’m not quite convinced my last 2 years strat has been the best idea. I have no way of knowing if the loans I dump go to default or back to current eventually. There is a real posibility I’d be better off just letting them ride. Starting in 2012 I plan to do so. No more selling grace period/lates. We’ll see how it turns out! But overall, VERY happy I discovered Lending Club. It has been solid, and heads above any other investments I have in returns. Thanks for sharing such specific details. I’m kicking around, in the back of my mind, whether or not to become a lender on one of these peer-to-peer sites, but I’m still undecided. Seeing such specific results (as opposed to hearing hypotheticals or averages) is really helpful. I’m inching closer towards going for it. @Paula, If you are thinking about investing I recommend you read my free ebook, Understanding Peer to Peer Lending. This will give you some background and help you to start investing the right way. I hope Lazy Man won’t mind my shameless plug. Just click on my link above and you will see the ebook on my site. LAZYMAN. I downloaded the lending club loan data and deleted the most recent 16 months (see http://www.sociallending.net/peer_lending/the-peer-to-peer-lending-default-curve/). Out of 11362 loans approximately 13% are bad (I define bad as Really late, Default, or Charged off). I then applied your filters to the data and the dataset shrunk to 14 loans which tells me that you are going to have a hard time finding loans that match your criteria. Here’s the most important point, of those 14 loans 3 were Charged off and 1 was really late (31-120). That’s almost 29% that are bad. Now, past performance is no guarantee of future results, but I wouldn’t invest using those filters. I don’t know how to reconcile your data. I’ve had no problem finding loans to fit my criteria. I’ve invested in a lot more than 14 in the past year. I just looked over what I wrote and perhaps my greater than sign was misleading. It was meant to also be an equal to. For example, when I said a credit score greater than 714, I meant 714+ not in the next range which would be 750. When I said a credit grade greater than D or 17.23%, I obviously meant to include D. That’s probably one of the mix-ups. How are you downloading the data? I wouldn’t base an investing decision on a sample size of 14 loans – it is simply too small. It doesn’t seem to add up that the loans that I’m choosing typically have a 12-13% rate of return according to Lending Club if 29% of them coming up bad. Something’s wrong here. Interest rate > 15%; Purpose = vacation, Wedding, Debt Consolidation/credit card, Car, Major Purchase; Inquiries = 0 and 2; “month since last record” = Null; revolving credit < $35,000; FICO = 679 – 713 and 714-749. Applying those criteria drops my data set down to 84 (which is a little on the small side) but only 3 loans have been charged off (around 4%). I got the >= when I first read it. When lending club says you will have a 12% average return, it’s their guess based on the loan GRADE only, you can obviously make your returns much better or worse depending on your filters. By adding a filter, you’ve changed the game and that average no longer applies. If you chose a small business loan with 7 inquiries and carrying a high debt load D grade loan, that would have a much higher default rate than a wedding 0 inquiry D grade loan. Peter has a good explanation here: http://www.sociallending.net/investing-lending/is-this-a-common-new-p2p-investor-mistake/ about why LC’s guesstimate is misleading (comments are good too). The low number then compared to now is because they are RAPIDLY expanding loan volume. One has to be careful when analyzing the data because all of those new current loans distort the results. It doesn’t make sense that is based on loan grade only. I’ve had quite a variety of percentages even when I’ve had one loan of grade E. For example today, I bid on a loan that had an E1 grade and I saw a projected return above 13.25% – I have never seen this on a grade E loan. I read the post on Peter’s site. It didn’t say that the projections were based on loan grade only. Maybe I missed it. Presumably “the small business loan with 7 inquiries and carrying a high debt load D grade loan” and the “wedding 0 inquiry D grade loan” would have different Expected Default Rates and thus the later would have the better projected return. I’m not saying that Lending Club takes all the factors (wedding vs. business loan) into account, but I’m very sure that it would take inquiries into account. The post talked about the guesstimate from Prosper being based on a “basket of similar loans”. My point was I don’t think LC does a lot of analysis to determine that guesstimate and things like filters and lack of diversification can hose those numbers. Since LC publishes expected returns in their prospectus for each loan grade, I assumed they were static. This is probably a question for Rob G or Chris Young @ LC. You’ve done really well in the past 8 months. Don’t be surprised or dismayed if your NAR number levels off at this point though. All those notes that you’ve been buying in the last 8 months are just entering or will soon be entering the period of time that historically has produced the largest number of defaults (around the 9-14 month mark) And as I’m guessing you’ve already experienced, each charge off hurts your numbers substantially, especially given the relatively small number of notes in your portfolio. I’m guessing that you’ve already concluded that it’s highly unlikely that you’ll improve as much in the next 8 months as you have in the past 8. I’m well aware that I’m probably close to a dropping off point soon. It may not be well known, but I jumped into p2p investing back with Prosper in February of 2006. P2P is old hat to me ;-). Lazy Man/Lou, My understanding is that the projections are based on a similar basket of loans although LC doesn’t provide an exact explanation of how they obtain that number. I am going to look into that and do a follow up post some time on Projected Return. By the way Rob Garcia is no longer at Lending Club. Thanks Peter, that was my understanding as well. I’m sure I’ll run into Rob Garcia in the coming months as we run in the same circles in Silicon Valley (met with him a dozen times or so). I could ask him, but as you mentioned, he’s moved on. Good luck in getting LC to publish their definition of “similar basket of loans”, I presume that is kind of the fuzzy logic that they aren’t likely to discuss. If they did want to disclose it, I presume they would have in a FAQ on their website. Ive been on the side lines of Lending Club and wondering if I should get involved. This is a great post. Love to see someone actually doing it and posting their results. My question.. have you lost money with LC yet? Your percentages are beating any savings or cd, definitely makes me interested. I just did a review of my P2P lending accounts. They’re literally doing 10X better than savings accounts. You have to take the risks to earn the rewards. Thanks for the updates. It has increased my comfort zone about this company and investment. One thing I saw somewhere else that I will add as a possible filter value is Total Loan Amount < 80% of Maximum allowed. I agree that if a person planned to skip on the loan from the start they will go for as much as they can scam. I don’t see the filters that you mention. The only things that it shows me are average rate (to set the range of interest rate to search), Status (never late/current/late) and remaining payments. How do I find these filters that you mention?